Creator of the Alexander Method of SMR Certifications. 20 years experience as a personal trainer. Over 10 years as a specialist in functional movement and self-care through SMR concepts. Certified by NASM (CPT, CES), FMS, ISSA (CPT, PNS), and CrossFit. Gym owner in Southern California with his wife, Carolyn. 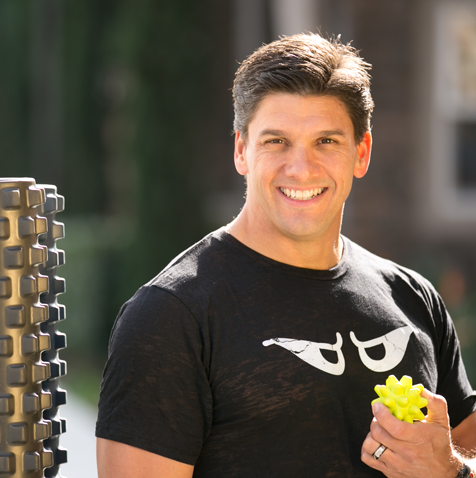 Jeff has toured the USA since 2007 and internationally since 2014 teaching fitness instructors and athletes from many backgrounds how to manage their therapeutic efforts through better technique and tool selections more appropriate for their chosen activity or sport. He’ll teach you how to better manage your self-care strategy so you can get the best results in the shortest time. Work smarter so you can recover faster and train harder. Thanks for the positive feedback! We’re trying to make this site better all the time, and your encouragement makes us try even harder. If you attempt any self-therapy techniques (SMR or other)and you have any increase in pain or muscular dysfunction, then you need to see a qualified therapist to get a proper diagnosis. Not all muscle problems (trigger points, adhesions, contraction knots, etc.) can nor should they be addressed all by yourself. If you apply pressure to the affected area (although it might be really uncomfortable at first) and the tightness seems to decrease along with the functional use of your leg muscles increase, then proceed to train and do your SMR homework at the same time. Otherwise, be smart and ask someone qualified for their hands-on assistance. HI Jeff, I’m pghgirl100 on your youtube vidio about quad TP’s. I just have a quick question…do I have to stop running for this TP to heal? Or can I still work it out and run at the same time?